Ships within 2 weeks. Please allow up to 2 additional weeks transit time for your item to arrive. 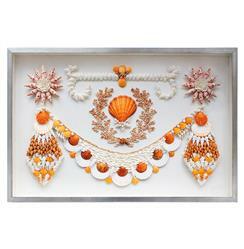 Reminiscent of the shell grottoes found in 18th and 19th century Europe, this framed piece of shell art invokes the charm and feminine wonder of the sea and sea shells. Traditional homes and nautical style spaces will find this a perfect compliment. This item is made to order, please allow up to 3 weeks for production.